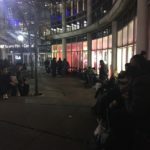 The day has finally arrived—Apple has launched iPhone X sales in Canada, with many lining up outside Apple Stores (and still in line!) for the company’s tenth anniversary smartphone, which features new Face ID technology and a 5.8-inch OLED display. iPhone X is priced at $1319 for the 64GB model and $1529 for the 128GB model from Apple. Carrier pricing from Rogers, Telus and Bell starts at $599 for a 64GB iPhone X on a two-year term, with minimum $95 per month plan. Initial iPhone X pre-orders are set to delivery today across Canada, while for those who missed out, Reserve and Pick Up will resume on November 4 at 6AM local time. Did you get your iPhone X yet? How do you like it so far?